Approx 90% of people with Parkinson’s develop speech problems in the early stages of the disease. In later stages 100% of people have speech difficulties. It is easier to learn the techniques for a stronger voice in the early stages and then maintain it in later stages, than to start working on your voice once it is a big issue for you. Do people complain that they can’t hear you? People with Parkinson’s speak quietly, but don’t realise that they are doing so. They think that the rest of the world, including their dog, has gone deaf! Does your voice sound hoarse? Does your face lack facial expression? is evidence based, internationally recognised and NICE recommended in the UK for voice problems associated with Parkinson’s disease. It is an intensive programme of therapy sessions, based on exercise science, that retrains your speech and voice in a way that, research has shown, still has benefits two years past the end of therapy. 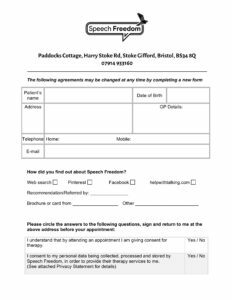 The aim is for clients to be able to use their stronger, clearer voice at home and work, on the phone and wherever else they need to speak. The positive effects of LSVT can also impact on facial expression and swallowing. After therapy LSVT clients need to continue to practice a short set of exercises daily. This short video from LSVT Global shows Shirley both before and after doing the programme. This longer video tells you more about the programme. You’ll see Shirley again too. Please contact me to discuss whether may be suitable for you. The strong evidence base for LSVT assumes that all the elements below are included. This is a two hour appointment to make sure that LSVT is right for you and to gather baseline information. You will also be referred to an ENT Consultant to check that your larynx is healthy prior to undertaking this exercise programme. This can be an NHS or private referral. There are 16 hours of therapy spread over 4 weeks. One hour daily for 4 consecutive days a week, eg. Monday, Tuesday, Wednesday, Thursday. I can accommodate running therapy on Monday to Thursday, Tuesday to Friday, or Wednesday to Saturday. Therapy sessions can be held either in clinic in Bristol, your workplace or in your own home, to suit each appointment. On therapy days you have around 20 mins homework to do. On non-therapy days you have around 30 mins homework to do twice a day. Some homework elements are the same every day, and some are changed daily. After therapy has finished, you need to to exercises daily to maintain your speech and voice. I will contact you every six months after therapy finishes to check you are maintaining your speech and voice. You may sometimes want a top-up session. The assessment session takes two hours. An interview about your health and life. Having a family member or carer at this appointment would be helpful. Therapy sessions are conducted 1:1 with the therapist and client. The hour long therapy session is an hour’s physical exercise for your voice, split into short blocks of different activities. The format is the same at every session, though the materials used change from day to day, and week to week. The therapy is conducted using the LSVT Companion specialist software. You will be encouraged to use your stronger voice from the first day of therapy. Pay-per-week at my standard hourly rate, due at the start of each week. This is due prior to your appointment. There is no travel charge for LSVT appointments at your home in Bristol (BS postcode area). If you would like to book an assessment session, please see the appointments page for further information. If you like the software in clinic, you have the opportunity to purchase a home/client edition for you to use at home. It collects all the data you need. This is only available to clients working with an LSVT therapist and costs around £250 including delivery. It is shipped from the USA with a calibrated microphone. I charge a setup fee of £40 to load your homework onto the database. You would need to install the software on your PC. Please see the LSVT Global website for the system requirements and more information on LSVTC. I can loan you a copy of the LSVT Homework Helper DVD, and it is available to purchase from LSVT Global. I needn’t have worried. Susannah is a joy to work with. She is encouraging, direct, and with a warm personality. She is also experienced and loves her work. By the end of the course, I felt much more confident about talking and armed with the exercises, was ready to face the world.